To be honest, I’m not a big fan of D23. I think a fan club is the sort of stuff Disney should be doing for free. To tie some sort of merchandising to a Disney club cheapens the experience. That said everyone I spoke with who attended last year’s D23, reported what a great event it was an this year’s is shaping up similarly. If you want to attend you’ll likely get to see all sorts of fun stuff like newly released concept art, theme park models, TV pilots, and more all before anyone else does. One of the interesting aspects of the D23 Expo is how it’s almost a mini Comic-Con. In fact, it replaces much of Disney’s outreach at the Comic-Con (except for the obvious Marvel and some ABC tie-ins this year). Plus a lot of the Disney online fan community will be there either hosting Podcasts or selling books they’ve written. So it’s a good chance to meet and greet the people you’ve only known online. 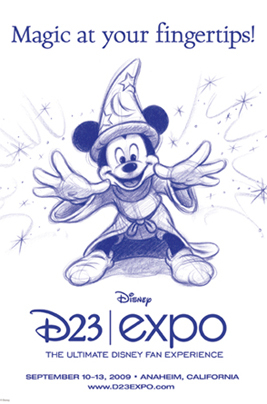 Tickets to the August 19-21st D23 Expo in Anaheim, CA are available at http://www.D23Expo.com. Admission includes access to all experiences and entertainment at the D23 Expo, including the Disney Legends Ceremony, and can be purchased for single days or for the full three days of festivities. Admission is $47 for a one-day adult ticket and $37 for children 3-12. Three-day passes are $136 for adults and $106 for children. If you are going, what are you looking forward to seeing the most? What rumor do you hope is confirmed? As rumored last week D23, Disney’s attempt an official fan club, has postponed the D23 Expo for one year. 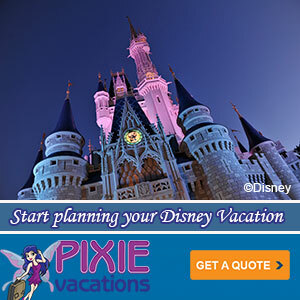 Instead they’re offering a smaller event in the fall focused exclusively on Disneyland. Additionally, the 2011 D23 Expo will be 3 days long and not four. I wish them the best of luck as they try to figure out how to make D23 more successful for the company and for its fans. D23: The Official Community for Disney Fans today announced complete details for three incredible holiday events this December. D23 Members will get a chance to deck the halls and experience the wonder of the season like never before through incredible offerings at the Walt Disney World and Disneyland resorts as well as a very special “Disney and Dickens” event celebrating Christmases past and present in Hollywood. With D23 launching its first Expo tomorrow it seems like an odd time for the club to be looking forward. But for all the members who can’t make it to Anaheim for the event, perhaps you’ll find something in your area you can attend later this year. One of the complaints I’ve heard the most about D23 is that other than the Magazine, there just isn’t much offered for the average fan. This roster seem much too limited for a club that a company the size of The Walt Disney Company can pull off. The other complaint is about the cost of the club. We might see some movement on that next year. The Walt Disney Company is rolling out the red carpet and a whole lot more for its fans at the inaugural D23 Expo. They’ve just released the Event Schedule with lots of great details for this amazing Disney Fan event. Plan to be in Anaheim September 10-13 to check everything out. Exciting details about the activities and events planned for the four days of Disney’s inaugural D23 EXPO have just been announced. There is so much to see you’re going to have to plan carefully. The D23 EXPO is open to the public. Tickets for individual days or the full four days of this Ultimate Disney Fan Event are available at the website. The D23 EXPO will offer guests the chance to get sneak peeks of upcoming Disney movies like The Princess and the Frog, TRON: Legacy, Prince of Persia: The Sands of Time, Rapunzel, Disney’s A Christmas Carol, Tim Burton’s Alice in Wonderland and many others. The D23 EXPO also will present the U.S. premiere screenings of Toy Story and Toy Story 2 in Disney Digital 3D™. More than that, the D23 EXPO will present several classic movies on the big screen, including the original Tron, Sleeping Beauty, The Shaggy Dog, Darby O’Gill and the Little People, along with other exciting screening events. The ABC House Screening Room will present screenings of new television entertainment, including ABC’s vibrant new fall schedule. The D23 EXPO will offer fascinating explorations of the past, present and future of Disney. Throughout the four days, scores of special panels and presentations will bring new insight into Disney history, let guests go “behind the magic” of Disney theme-park attractions and movies, and get fans up close and personal with the Disney legacy of unforgettable entertainment. A giant show floor filled with incredible pavilions and interactive areas assembles the entire world of Disney under one roof. From Disney’s global theme parks to the Company’s environmental initiatives, the show floor includes a collector’s area, a gathering of Disney licensees, an eight-room “home” showcasing an amazing array of Disney merchandise, and new technologies being developed by Walt Disney Imagineering. The show floor is the heart of the D23 EXPO. It will also be home to the “ABC House Screening Room,” a sign-up area for the “Lost University,” and kid-friendly play areas that make the D23 EXPO an exciting event for all ages of Disney fans. The legendary Walt Disney Archives will assemble a never-before-seen collection of more than 100 props, costumes and one-of-a-kind items from more than eight decades of Disney creativity. For the first time ever, the Archives also will present a retrospective of props and costumes from the classic “Captain EO” attraction in which Michael Jackson thrilled theme-park audiences in 3D. The 4,000-seat Anaheim Convention Center Arena will be home to spectacular presentations throughout the four days of the D23 EXPO. Disney President and CEO Bob Iger will kick off the entire event with an unforgettable presentation that includes a 30-minute glimpse at the upcoming animated feature The Princess and the Frog and a live performance by its vocal star, Anika Noni Rose. Other Arena presentations will incorporate surprise celebrity appearances as D23 EXPO guests learn about the future of ABC, Disney movies, theme parks, animation and more. Celebrities from both current and classic Disney projects (both on screen and behind the scenes) will be on hand throughout the D23 EXPO, and are currently scheduled to include: X Atencio, Jake T. Austin, Kathryn Beaumont, Richard Bellis, Tom Bergeron, Bruce Broughton, Cheryl Burke, Maria Canals-Barrera, Marge Champion, Ron Clements, Mary Costa, Alice Davis, David DeLuise, Joseph Fiennes, Michael Giacchino, Blaine Gibson, Selena Gomez, Kelsey Grammer, Don Hahn, David Henrie, Patricia Heaton, Tommy Kirk, Steve Lisberger, Joel McNeely, Brendan Milburn, John Musker, Ed O’Neill, Marty Sklar, Jennifer Stone, Valerie Vigoda and many more. Disney Consumer Products will give D23 EXPO guests the chance to explore a host of activities for the entire family, including a Disney Creativity Center hosted by Crayola, the Disney Princess Storytime and Royal Manners event, the Baby Einstein World of Discovery Center, and a magnificent live LEGO building event in which Master Builders will invite guests to join them to construct a life-sized mural of Disney characters, paying homage to the innovation of Disney and LEGO. There will be appearances by best-selling authors, fine artists, and toy designers. There will also be a series of fashion shows featuring the latest styles from Disney Couture, Disney Couture kids and the Wizards of Waverly Place collection. Guests will have the opportunity to tour the first-ever Disney Dream Home and to go “behind the fairy tale” at the Disney Fairy Tale Weddings showcase. I don’t know why I’m sharing this with you since it lessens my chance to win and, face it, I’m not making it out to California any other way in this economy. But hey maybe one of you will win and send me a collectible postcard or something. Still not convinced? Check out this video from the folks at D23 with a special look at some of the Disney archives items that might show up at the expo.